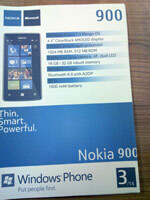 It turns out that Nokia 800 won't be the Windows Phone flagship of the Finnish company after all. Just a few hours before Nokia World kicks off we got a press photo and a specs sheet of the Nokia N900, which is shaping to be the most capable member of the Nokia WP gang. A specsheet of the Nokia 900 has unexpectedly appeared online, revealing pretty much everything we'd like to know about another of the upcoming Nokia Windows Phone 7 smartphones. The Nokia 900 will run Microsoft's Windows Phone 7.5 Mango OS, on a Snapdragon chipset, featuring a single-core 1.4GHz CPU and 1GB of RAM. At the front, the Nokia 900 will have a large 4.3-inch ClearBack AMOLED just like the Nokia 800 Sun. At the back an 8MP Carl Zeiss camera with auto-focus and dual LED flash will take care of taking photos. Underneath it will reside a 1800 mAh batter, which sounds quite promising. The Nokia 900 will feature NFC, Wi-Fi 802.11 b/g/n, Bluetooth 4.0 with A2DP and will come in 16GB and 32GB flavors. We can't wait for the Nokia World to start, so we can get to spend some quality time with this hot piece of smartphone. As you know we'll be covering the event live and we'll be bringing you the latest Nokia and Windows Phone news so keep watching this space. theres no support for dual core cpus at the moment as the performance gains dont justify the loss of battery life, as far as microsoft are concerned. next years Apollo update (WP8) is rumoured to support dual core cpus.